When I was in the fourth grade, I found out I had asthma. Finally, I understood why I couldn’t do the mandatory mile run without stopping to walk. Because of my asthma, I have always avoided exercise. I felt embarrassed when I wheezed and I didn’t want to carry my emergency inhaler with me everywhere. Fast forward 20-something years and ______ amount of pounds gained. In 2009, I finally signed up for a 2-year prepaid gym membership. I tried to go almost every day, and worked out on the cardio machines like the elliptical trainer and the recumbent cycle. I started losing weight and felt great about exercise. In 2012, I ended my membership at the big name gym and signed up for a smaller neighborhood gym. It was a life-changing decision. The staff there know me by name and it feels like they really care about my well being. Initially, I did the same things I did at the other gym—worked out on the elliptical, recumbent cycle, walked on the treadmill (with an incline) and rowed on the rowing machine. But one day, a personal trainer (who had been watching me & cheering me on) generously offered to show me for an entire hour, a bunch of beneficial exercises using body weight. She gave me a list of exercises I could do along with the cardio I’ve been doing. A few months later, she started teaching a boot camp class and encouraged me to join. Since then, I have been religiously going to her boot camp class and other classes offered by the gym. In the summer of 2013, I decided I wanted to challenge myself further by trying to run. I surprisingly found myself enjoying it! 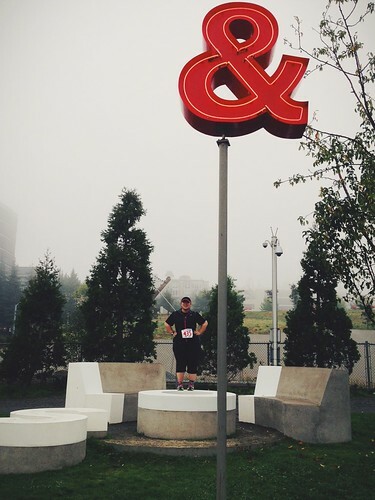 My goal for 2014 is to run the Seattle Rock ‘n’ Roll 1/2 Marathon. I’m aiming to cross the finish line safely. We all have to start somewhere and don’t worry about speed. It will come with time!!! Welcome and speed will come. The important thing is that you are doing something. I think you are a strong runner. You motivate and challenge me to keep up. It is a pleasure to share the road with you.